A planet has been found wandering through space on its own – without a parent star. The strange discovery is 100 light-years from Earth, and was spotted using ESO’s Very Large Telescope and the Canada-France-Hawaii Telescope. Scientists believe these ‘free floating’ worlds could be common – perhaps as numerous as the billions of ‘normal’ stars. The absence of a bright star very close to it, has allowed the team to study the probable planet’s atmosphere in great detail – and could provide insights that will allow scientists to study other ‘exoplanets’ nearer to stars. “Looking for planets around their stars is akin to studying a firefly sitting one centimetre away from a distant, powerful car headlight,” says Philippe Delorme (Institut de planetologie et d’astrophysique de Grenoble, lead author of the new study. 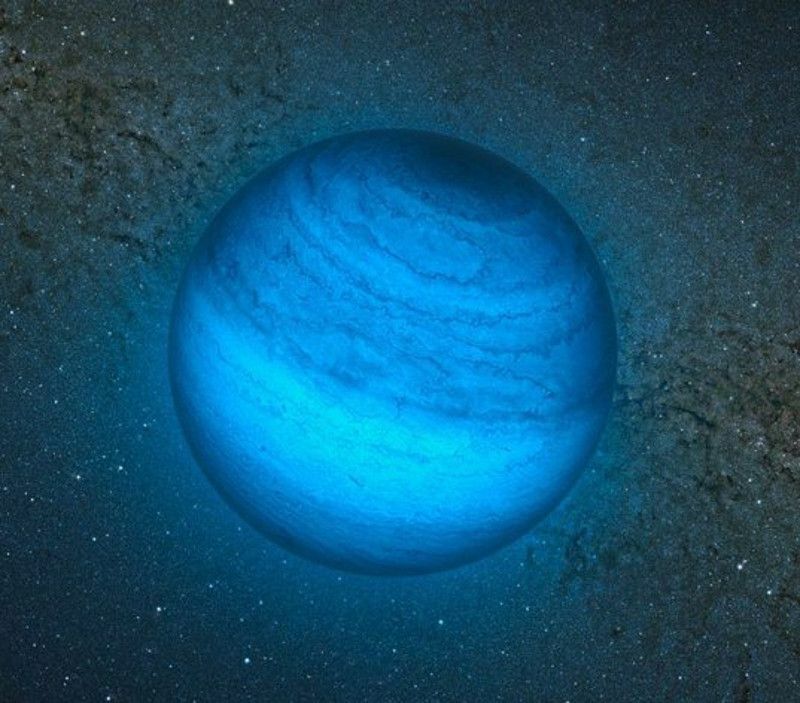 Free-floating objects like CFBDSIR2149 are thought to form either as normal planets that have been booted out of their home systems, or as lone objects like the smallest stars or brown dwarfs. “These objects are important, as they can either help us understand more about how planets may be ejected from planetary systems, or how very light objects can arise from the star formation process,” says Philippe Delorme. This object also gives astronomers a preview of the exoplanets that future instruments aim to image around stars other than the Sun. Free-floating planets are planetary-mass objects that roam through space without any ties to a star. Possible examples of such objects have been found before, but without knowing their ages, it was not possible for astronomers to know whether they were really planets or brown dwarfs — “failed” stars that lack the bulk to trigger the reactions that make stars shine. But astronomers have now discovered an object, labelled CFBDSIR2149, that seems to be part of a nearby stream of young stars known as the AB Doradus Moving Group. The researchers found the object in observations from the Canada-France-Hawaii Telescope and harnessed the power of ESO’s Very Large Telescope to examine its properties. The AB Doradus Moving Group is the closest such group to the Solar System. Its stars drift through space together and are thought to have formed at the same time. If the object is associated with this moving group — and hence it is a young object — it is possible to deduce much more about it, including its temperature, mass, and what its atmosphere is made of. There remains a small probability that the association with the moving group is by chance. The link between the new object and the moving group is the vital clue that allows astronomers to find the age of the newly discovered object. If CFBDSIR2149 is not associated with the AB Doradus Moving Group it is trickier to be sure of its nature and properties, and it may instead be a small brown dwarf. Both scenarios represent important questions about how planets and stars form and behave.